Land of the Giants have been drawing crowds to groove to their addictive, foot-stomping and contagious rhythms since 2009. They boast a brass section that will make you grin from ear to ear, heavy toe-tapping bass and Andy Quick’s sensuous, soaring vocals that will make you question why you’ve never danced your socks off to ‘The Giants’ before. 2017 was a busy year for Land of the Giants, we saw them at their sold out summer show at the Wharf in Tavistock, the wild and equally emotional night in early December when they played the last ever Maker Session at their spiritual home and we were fortunate enough to join them at their sold out Christmas show at The Hub in the heart of Plymouth. 2018 was the 9th year of Land of the Giants, it was supposed to be the year that they quietly “disappeared up their beanstalk” (as front-man Andy Quick put it) to pursue their individual projects. There is also talk of new material being written for an album which would celebrate 10 years of Land of the GIants in 2019. The first of these tracks being the very lovely “Shine On”. That said, they still managed an 8 date UK tour in March and graced the stages of a few festivals throughout the summer including BoomTown, Port Eliot and Perranporth’s Tunes in the Dunes and even had enough energy to throw in a cheeky acoustic set at Hope Cove in Devon. Andy Quick has been exploring his other voice, ‘The Andy Quick Band’, with a more eclectic, psychedelic but equally excellent sound and he has been ever present around the South West peninsula since the spring. Tom has been building a new music space at Maker Heights, ‘The Patchwork Studios’ which will be launching soon with the Magnificent John Fairhurst playing on the 27th October. Gaz continues to slave away on his PhD and there are several weddings in the offing. So that should have been that. 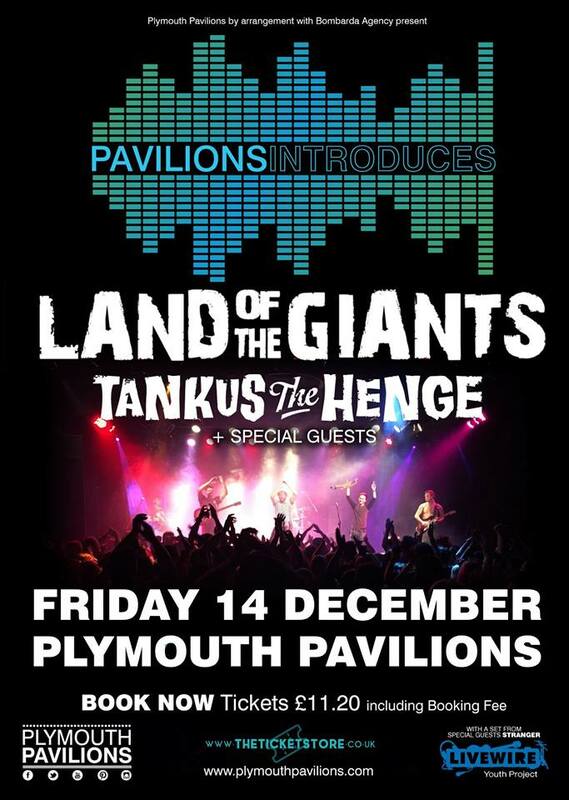 They’ve only gone and decided to lay on one hell of a Christmas show at the Pavilions in Plymouth on the 14th December…. Their annual festive party just ramped up a level or three! They’ll be joined by their comrades Tankus the Henge as they pilot an “intimate” concept in one of the South West's biggest venues. This is going to be massive, 1500 sweaty, bouncing bodies, leaping about like loons, watching The Giants on a new stage configuration which boasts an incredible sound system, it’s gonna be EPIC! Over a third of the tickets have already sold, making this quite literally, the HOTTEST ticket in town! Don’t expect the pubs to be open when the boys finally decide to knock it on the head, or management threaten to pull the plug to preserve their entertainment licence for the future! Just because the music might stop, it doesn’t mean that the party does. So do yourselves a favour, leave your car keys at home, call a babysitter and plan for a late one, we’ll see you there! To stay ahead of the crowd, why not treat yourself to an early Christmas gift by joining their OFFICIAL FAN GROUP and receiving news as it breaks….